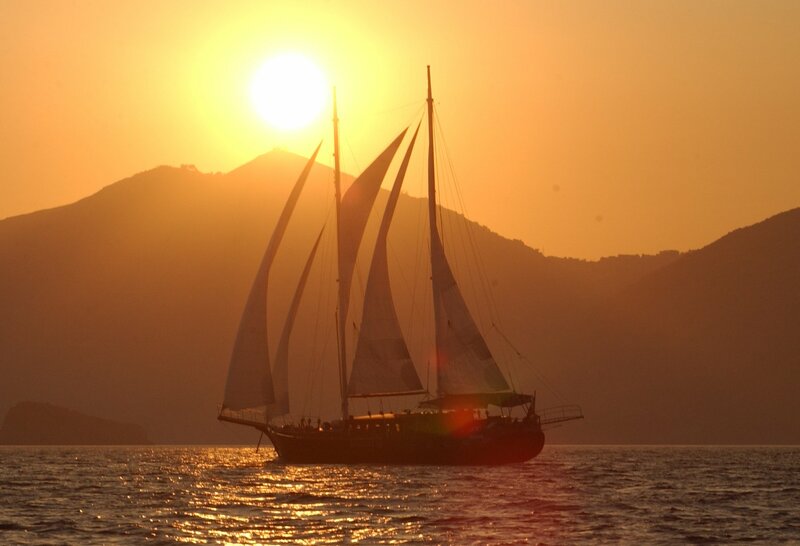 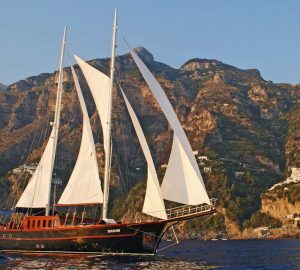 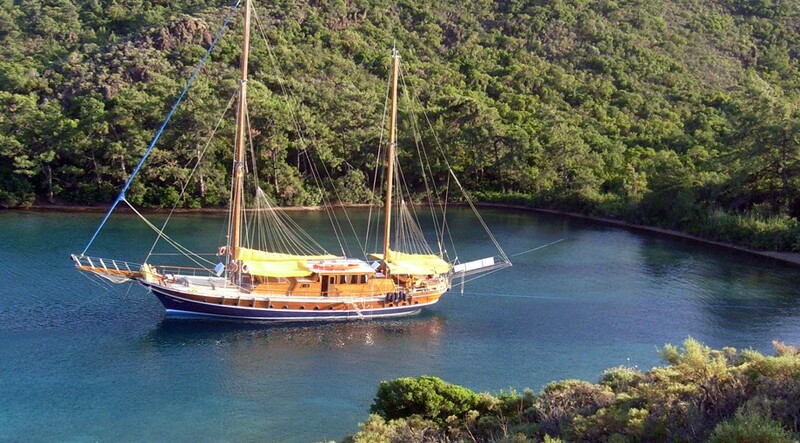 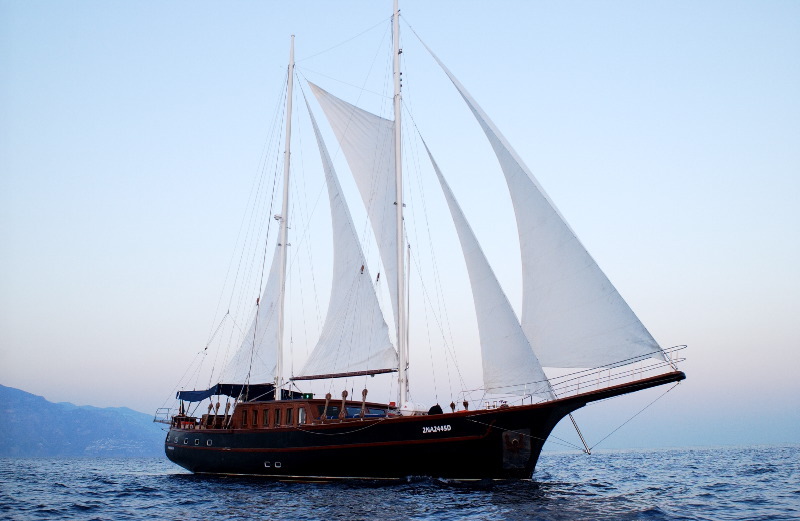 Sailing Schooner MYRA was designed and built by Turkish Ege Yat yacht builders in 2003, the yacht received a refit in 2010. 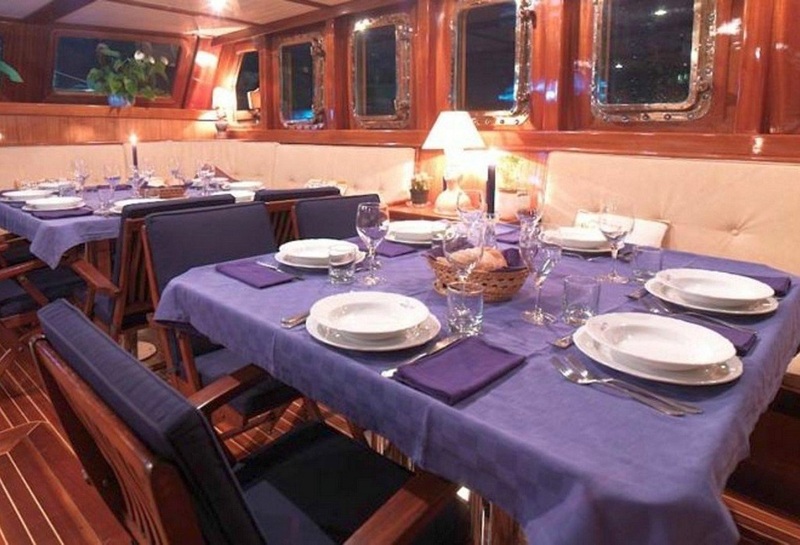 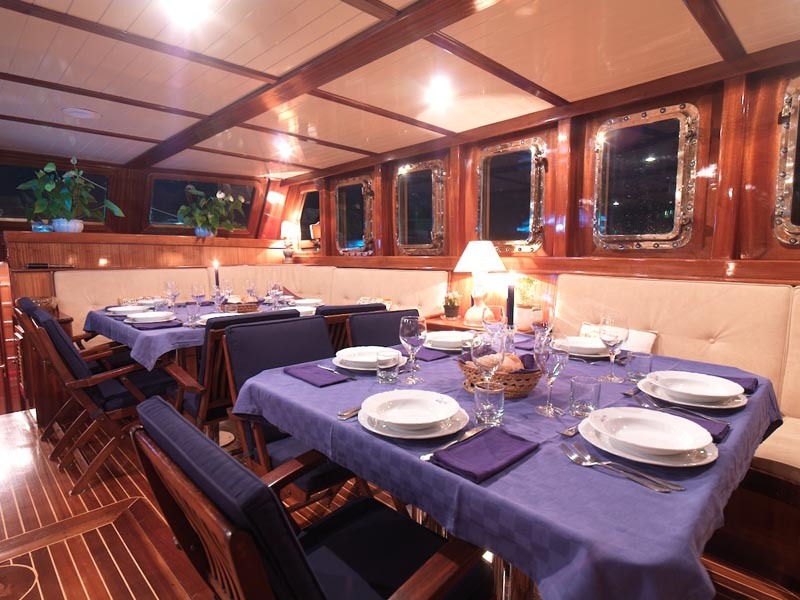 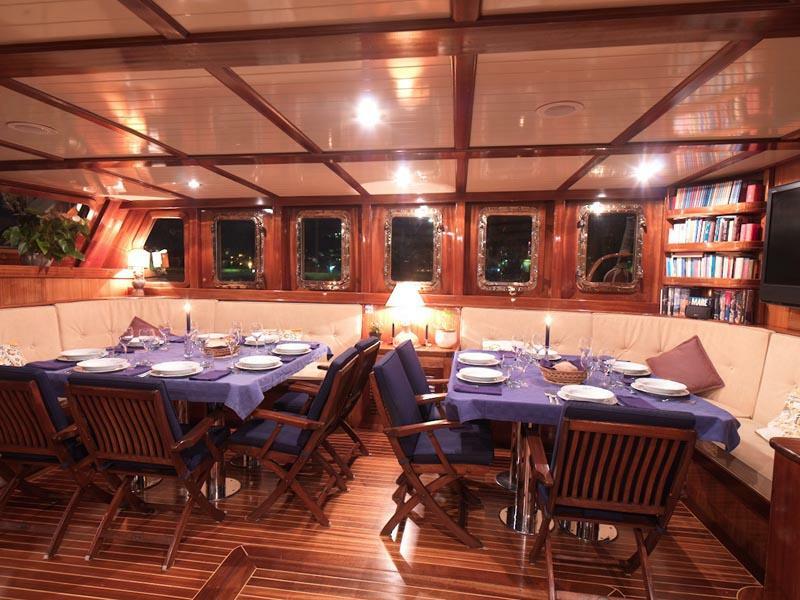 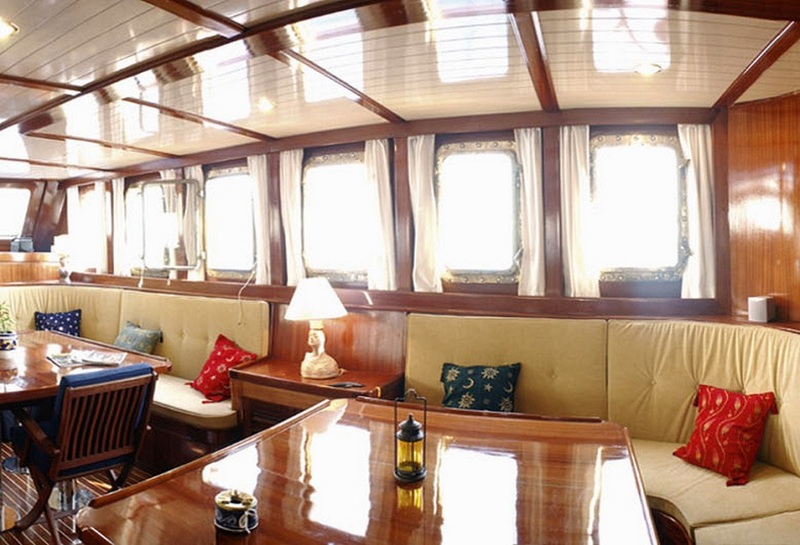 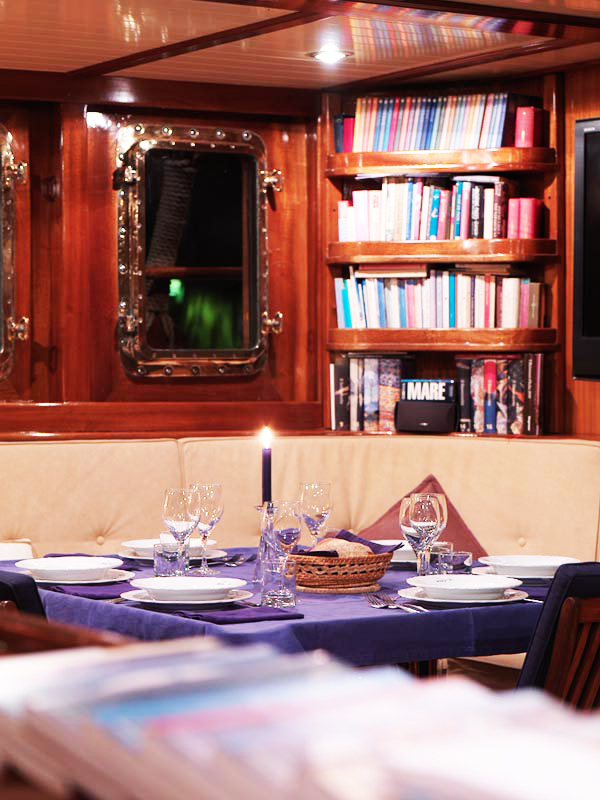 She accommodates up to 12 guests in 6 cabins, making her ideal for larger groups. 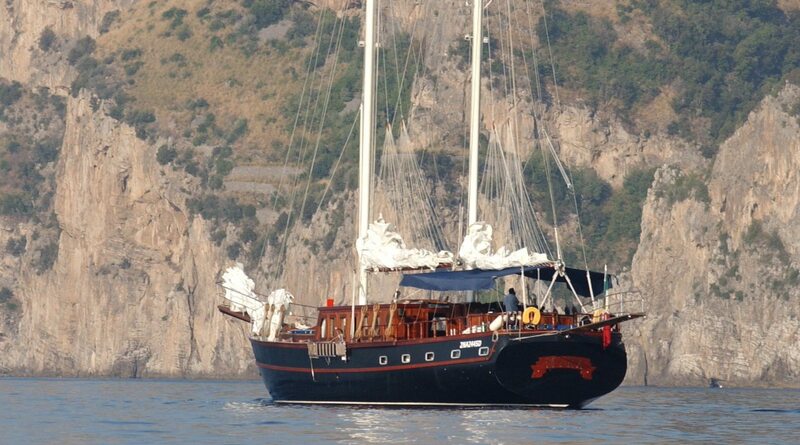 There is a traditional vibe about her. 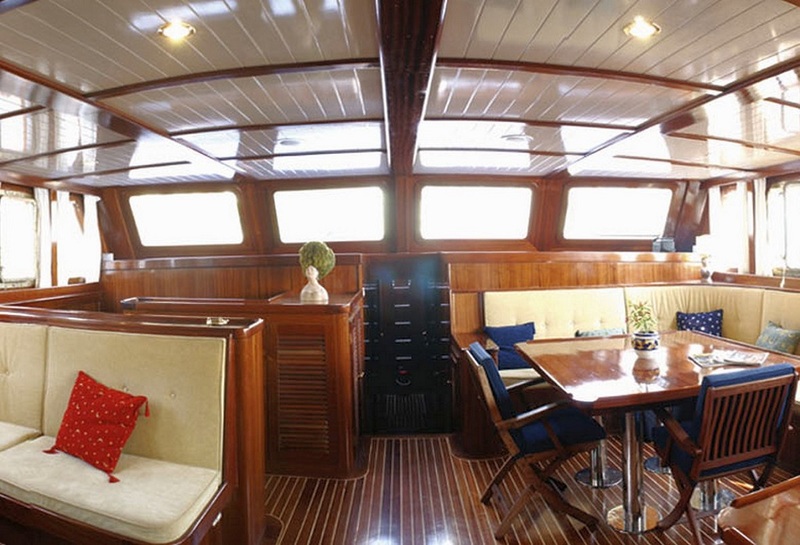 The exterior steel hull is painted deep rich black, her bulwarks are high gloss varnish and the decks a classic teak. 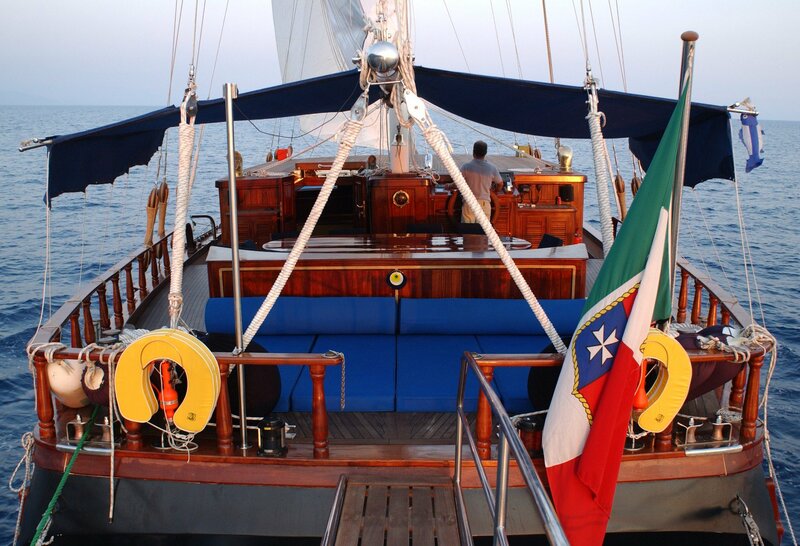 The interior is spacious and warm boasting fine woods panels and teak and holly inlay floors. 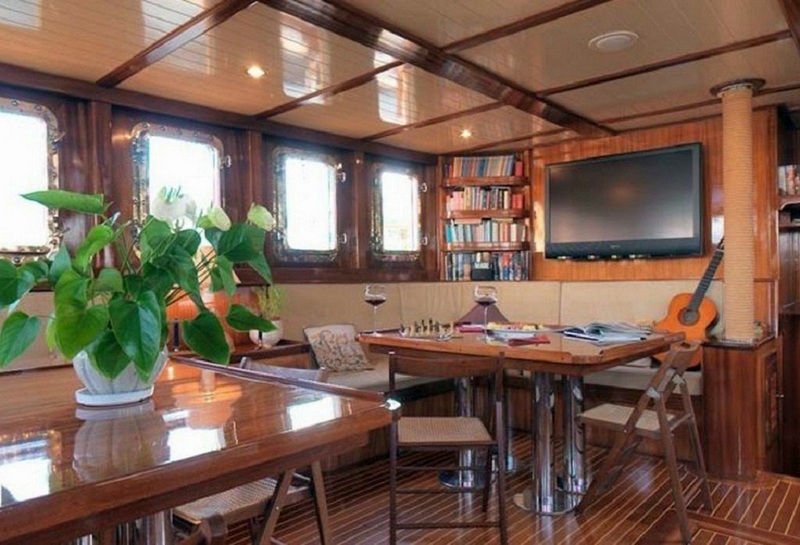 Aboard MYRA, the salon is in the raised deck house, large ports allow ample natural light and great viewing. 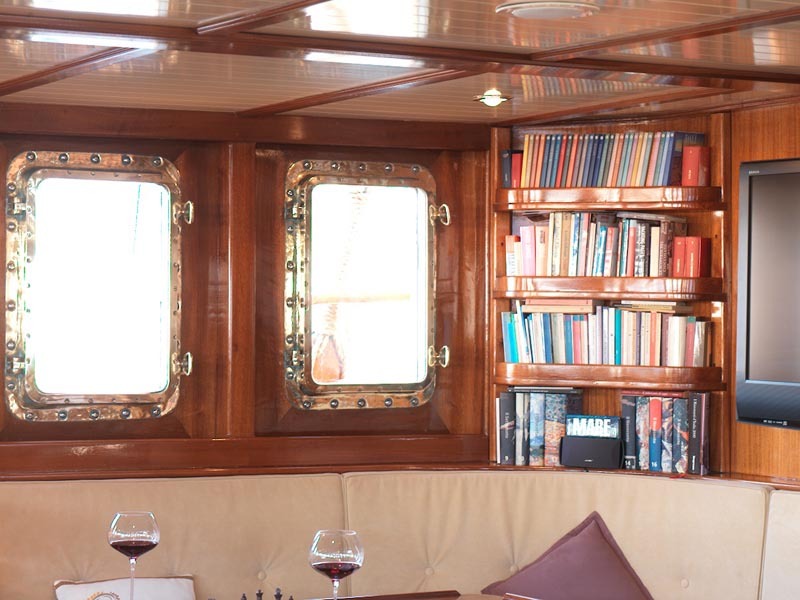 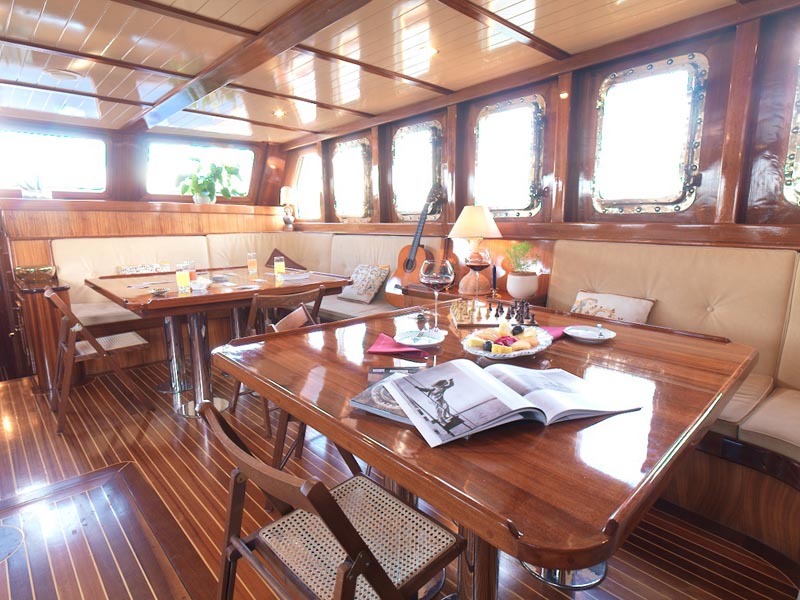 On the port side, 2 formal dining tables seat all 12 guests with room to spare, on the starboard side a built in lounge and coffee table invite guests to relax in comfort. 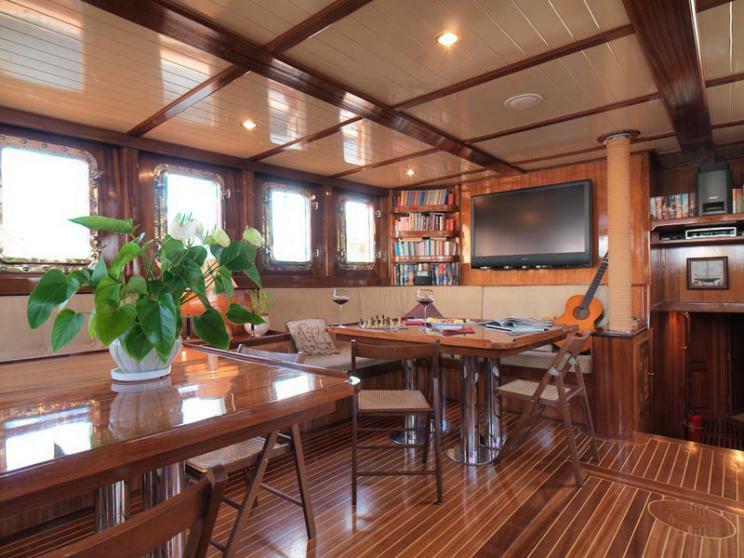 A flat screen TV and audio system are available for indoor entertainment. 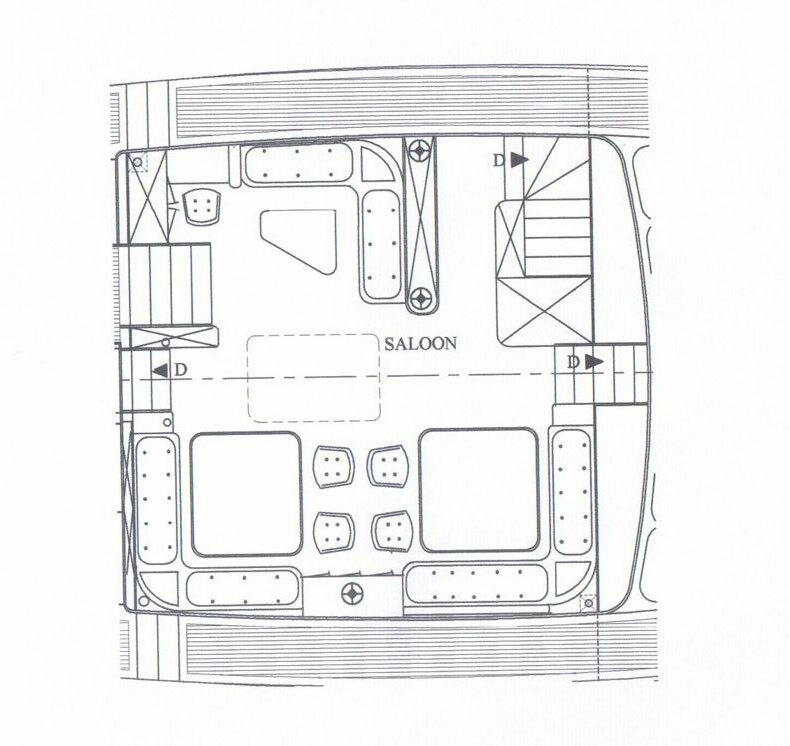 Four double guest cabins are forward of the salon, while 2 twin guests cabins are aft of the salon. 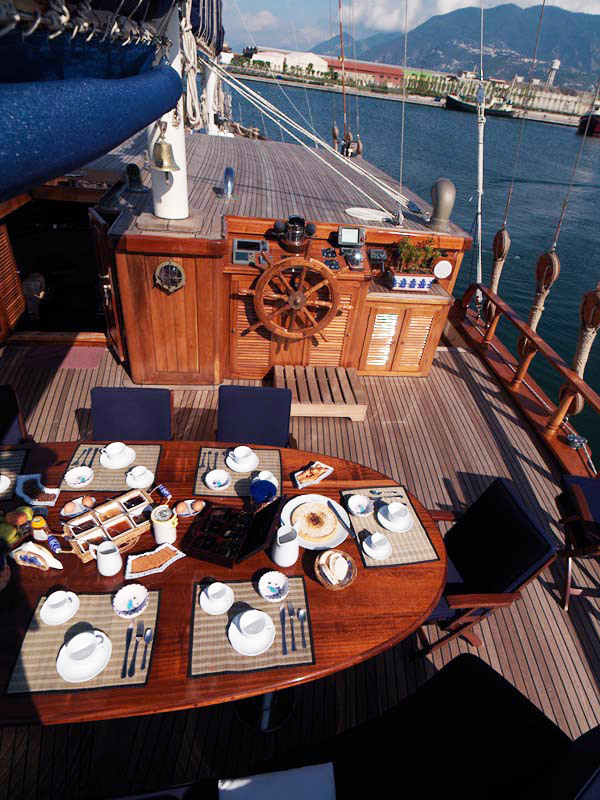 Exterior living on this beautiful sailing yacht is plenty where the aft deck offers an alfresco dining option, seating and aft facing sun pads, shade from a Bimini cover can be provided. 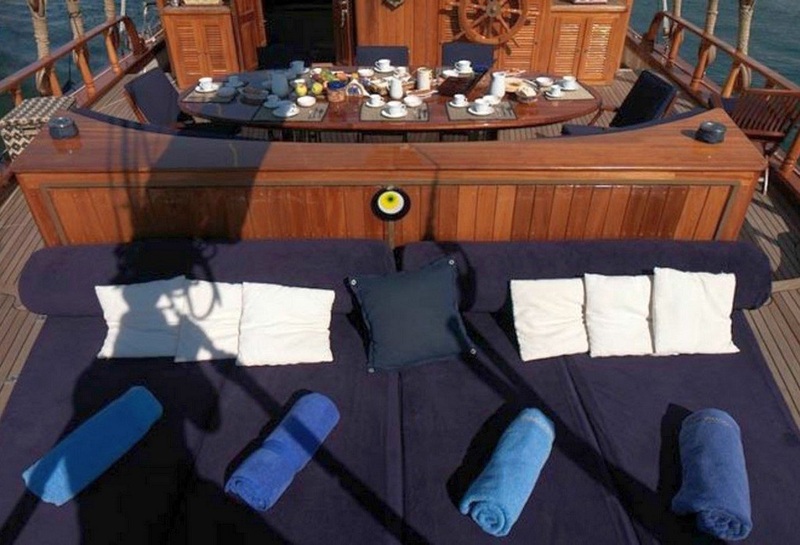 Further sun pads on the foredeck allow everyone to find a place to relax. 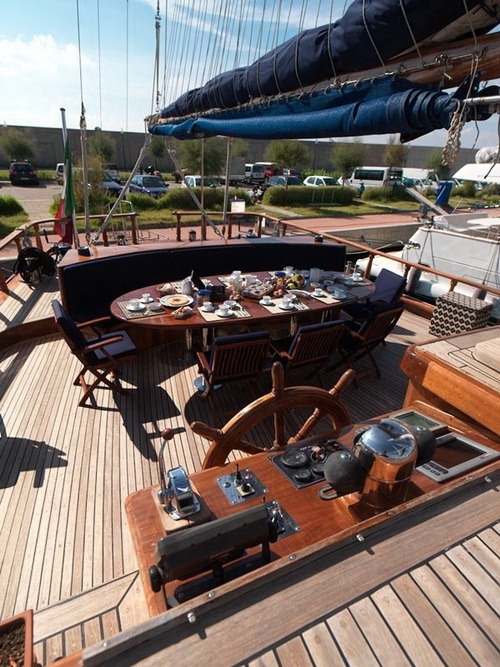 She boasts generous wrap around teaks decks, with high rails, the yacht is easy to walk around safely both at anchor and under sail. 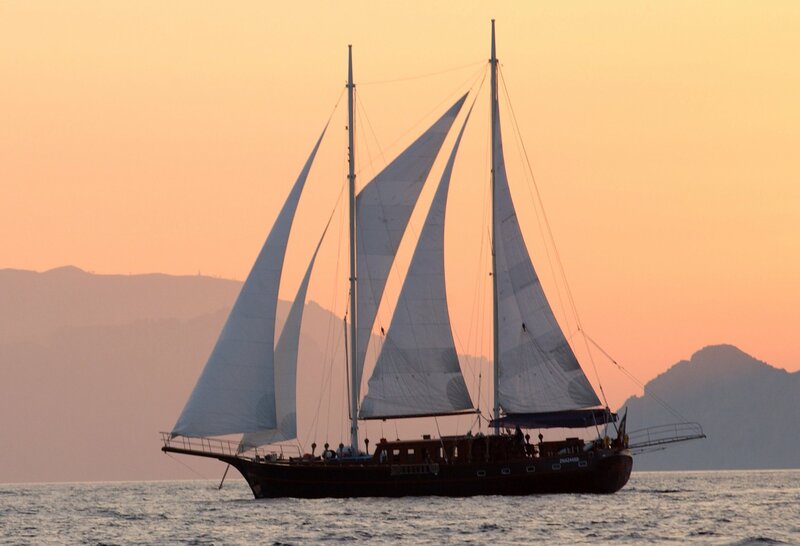 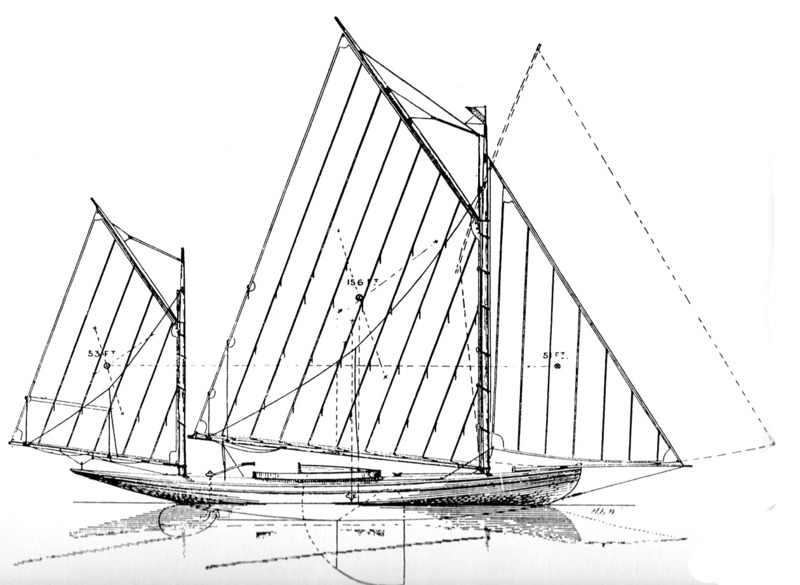 This Sailing schooner has a beam of 7.6m (25ft) and a draft of 2.7m (9ft), under full sail the yacht flies 5 sails, she is mechanically powered by 1 x 350hp Aifo Ivenco engine and is capable of 8.5 – 11 knots and has a professional permanent crew of 4. 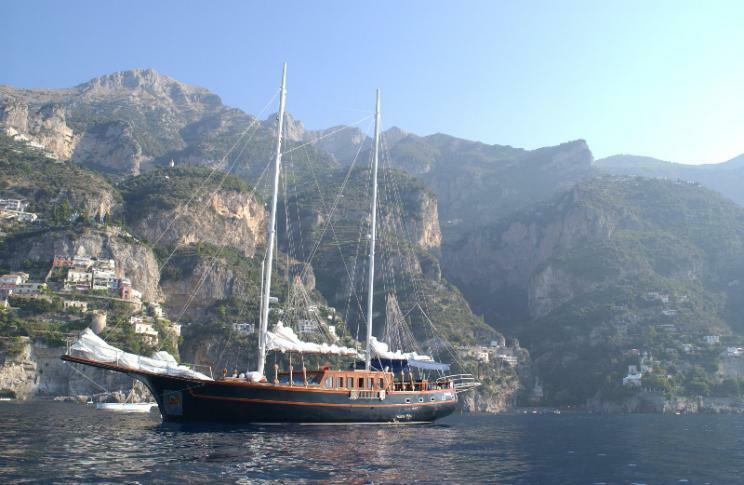 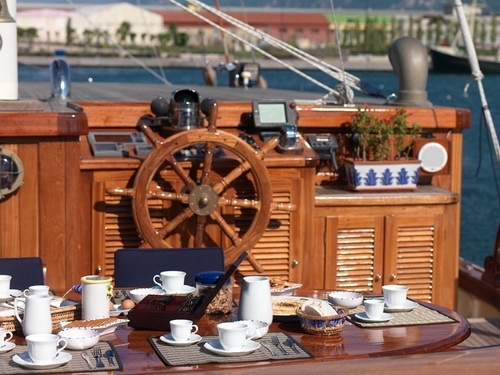 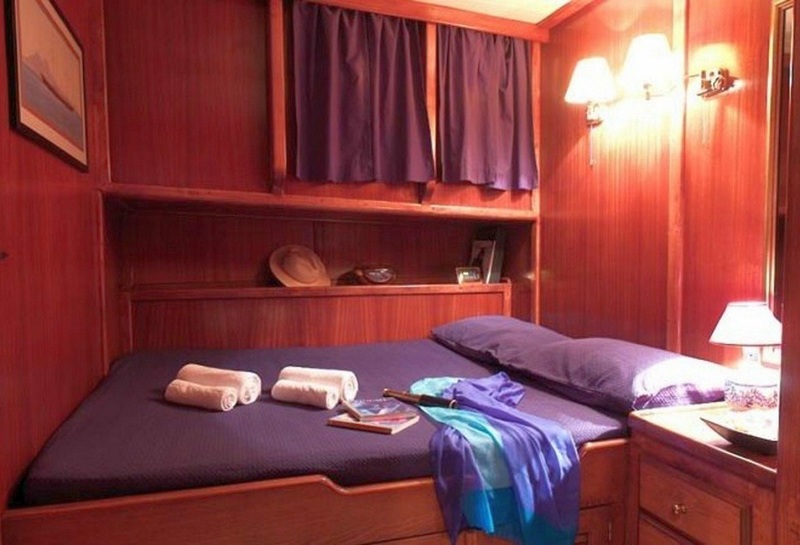 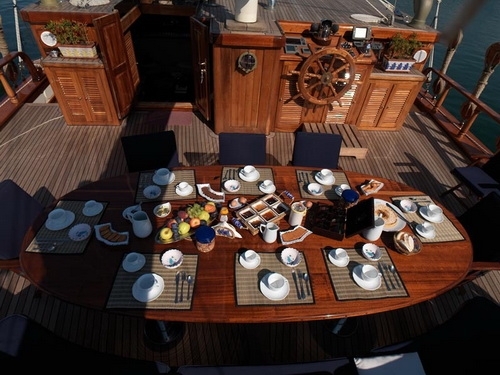 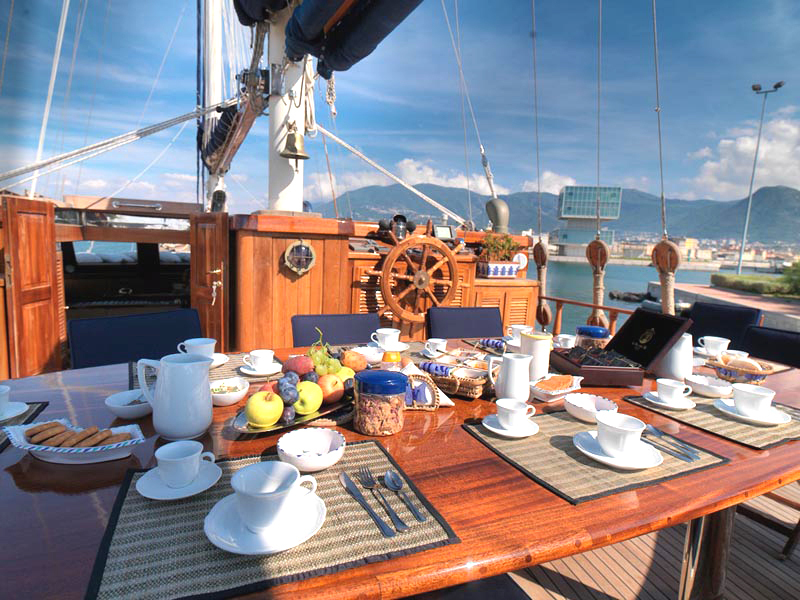 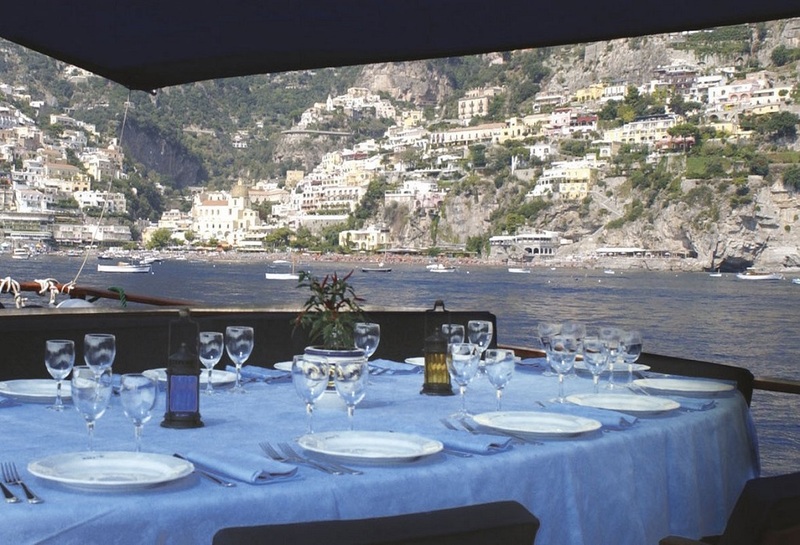 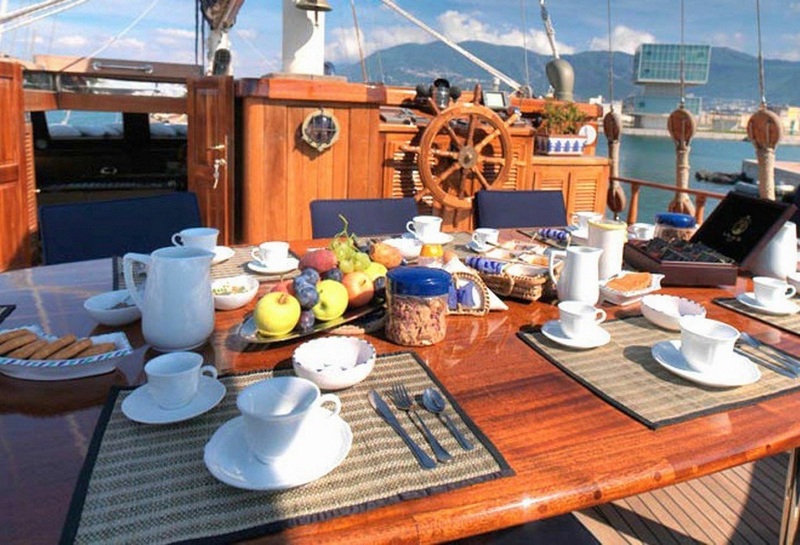 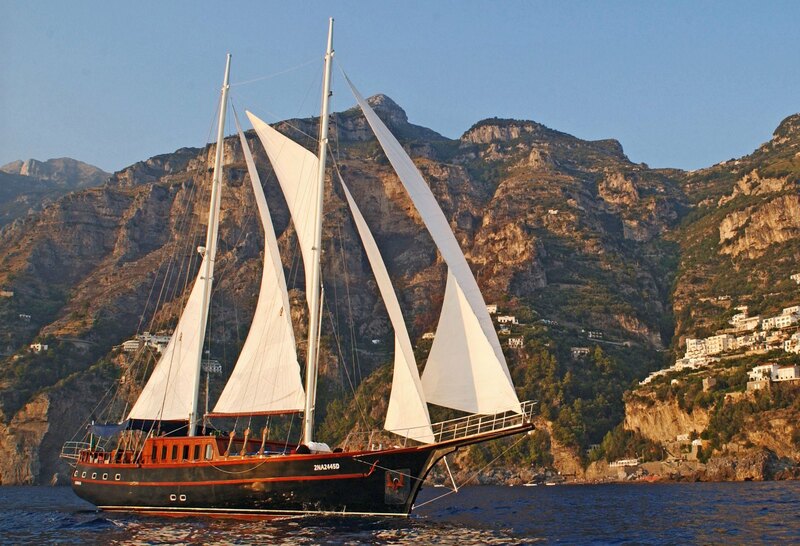 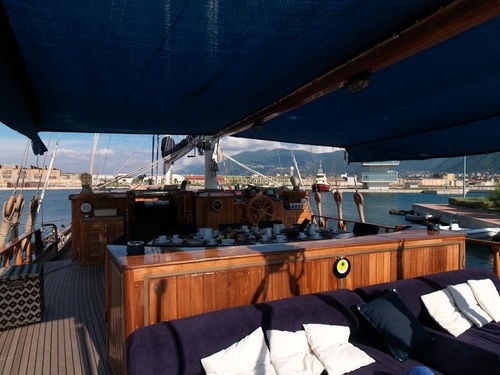 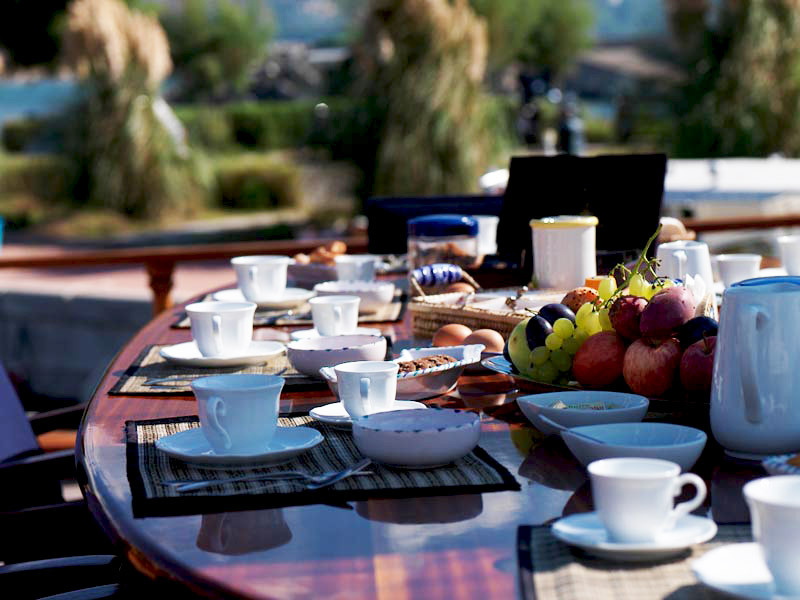 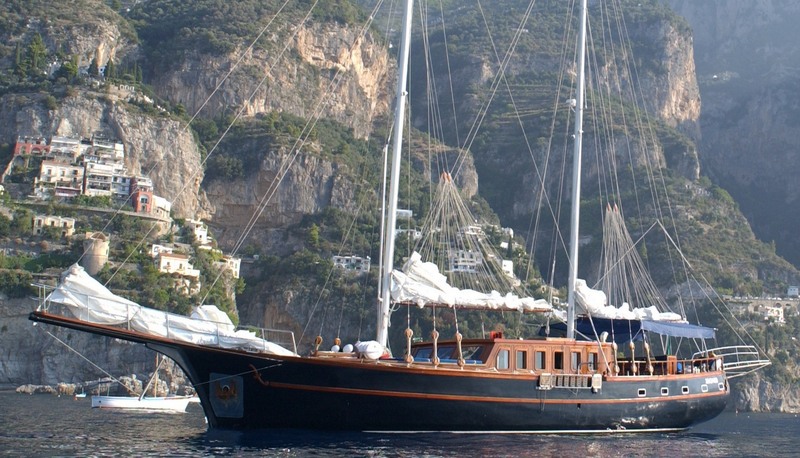 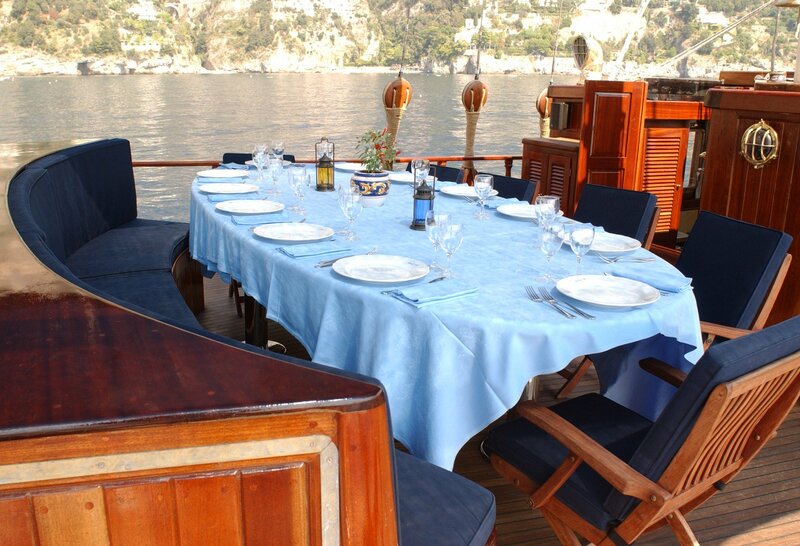 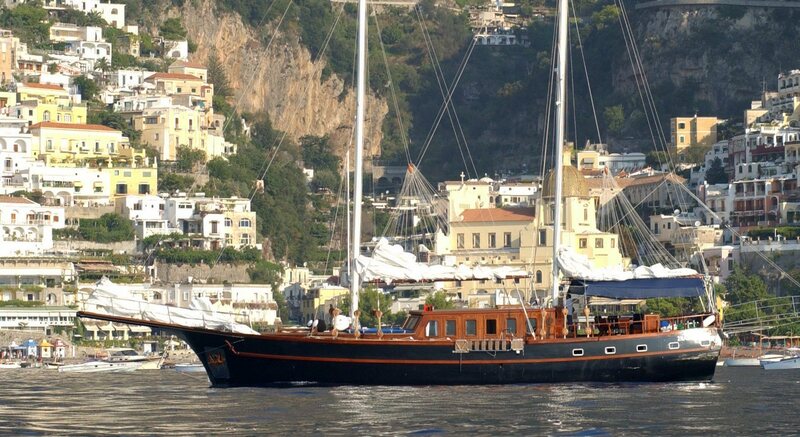 The MYRA sailing yacht can accommodate up to 12 guests in 6 en-suite cabins. 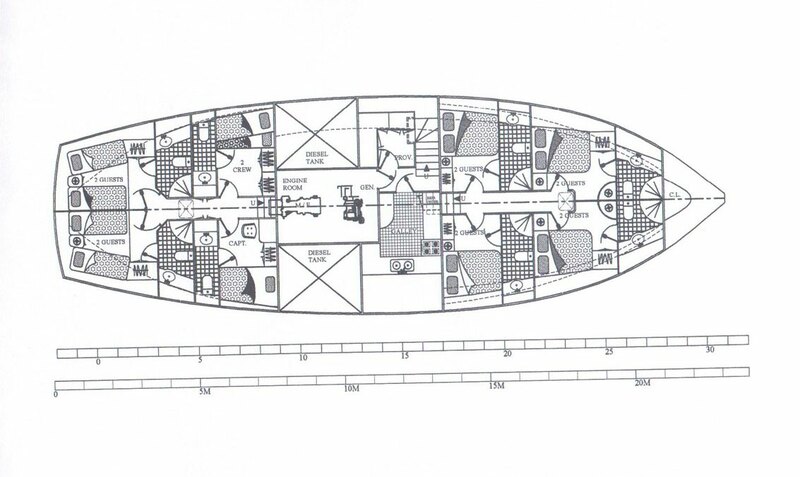 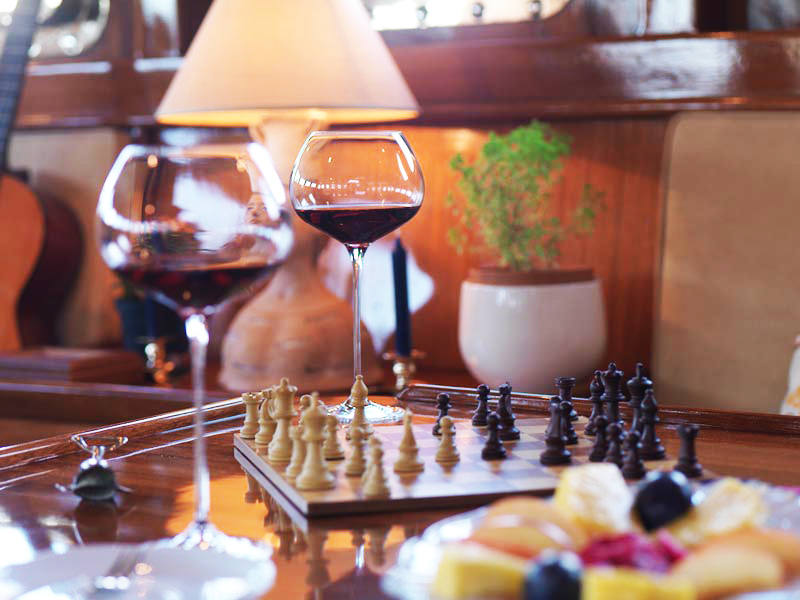 Forward of the salon: 4 double cabins, 2 on port and 2 on starboard. 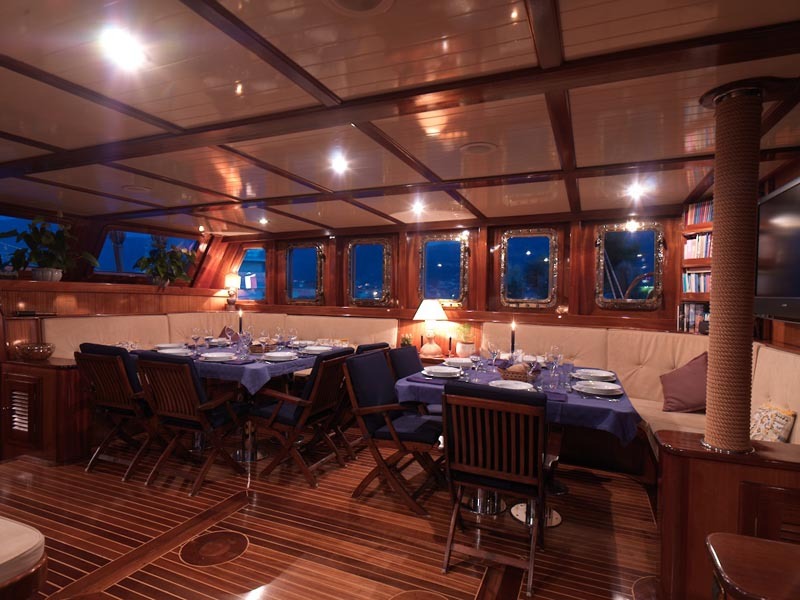 Aft of the salon is 2 twin cabins on port and starboard. 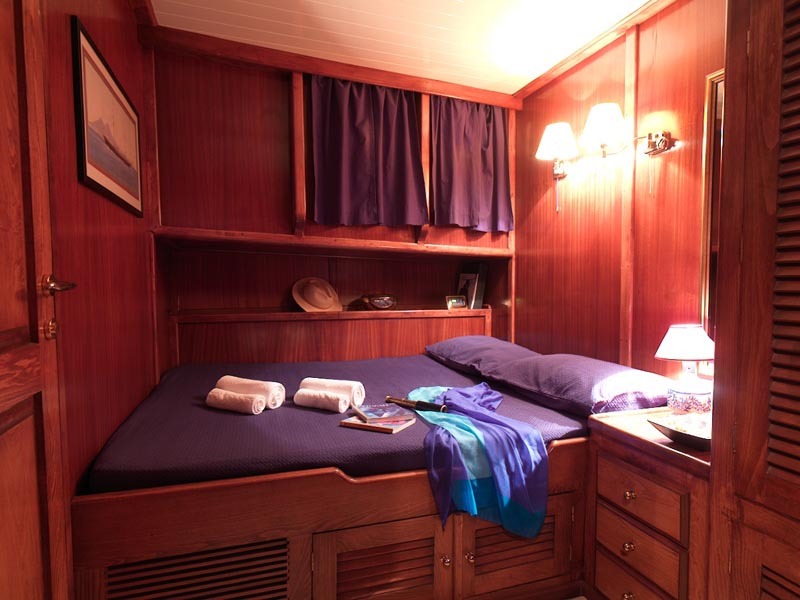 Each cabin has a simplistic warm atmosphere with a serene calm feel.